Do you have a favorite treat that you love but have felt too intimated to make? For me caramels have always fallen into this category. Until now! In this month’s Bon Appetit magazine I saw a recipe for caramels that I thought I could handle. Before I had the chance to second guess this decision I headed right for the kitchen. Actually, I first posted a question on Facebook asking if anyone had suggestions for me about making caramels. My blogging friend, Carla Cardello from Chocolate Moosey, responded right away with, “Yea – don’t burn yourself.” Very wise words to read BEFORE starting. I found that making caramels was really quite simple. I organized all of the ingredients before I started and then it was simply of matter of cooking the caramel on the stove, adding ingredients when needed and then letting the caramel cool before cutting. Quite frankly, my biggest challenge was figuring out how to cut the caramel without having caramel strings all over the place. I read several articles about this and opted to butter the knife in between slices. Alternatively, I could have dipped the knife into warm water between slices or sprayed the knife with nonstick cooking spray. It did not matter if some of my caramels had a few strings hanging down, because once the pieces are rolled in wax paper, their shape is formed. The recipe in the magazine called for bourbon, but I am not a bourbon drinker. I substituted vanilla extract in my first batch and then used Kahlua in my second batch. Either option is divine. The biggest lesson learned from this experience is to stop waiting to make something that seems too challenging. Take everything one step at a time and it will work out. In this case it not only worked out, but making caramels has now become a favorite of mine. This has inspired me, so that I think I’m ready to conquer my marshmallow phobia! Stay tuned. Spray an 8” x 8” baking pan with nonstick cooking spray and line the pan with parchment paper. Set aside. In a medium size saucepan , stir the sugar, corn syrup and water together over medium high heat until the sugar is dissolved. Stop stirring and cook until the mixer is a deep amber color, swirling the pan often. Remove the pan from the heat and whisk in the butter and sweetened condensed milk. This mixture will bubble so stir quickly but carefully. Attach a candy thermometer to the pan. Whisk constantly over medium high heat until the temperature reaches 240°. Remove from the heat and whisk in the Kahlua and kosher salt. Transfer to the prepared pan and cool completely. Once the caramel is cool, sprinkle the top with sea salt. Lift the parchment out of the pan and place on a cutting board. Butter a long knife and cut the caramels into squares or rectangles. 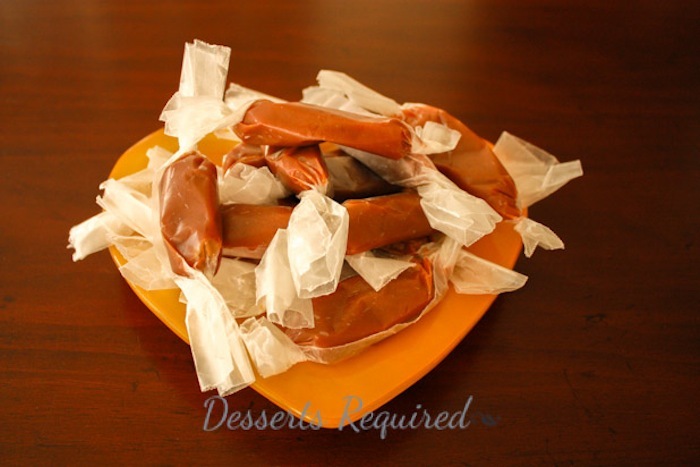 Wrap each caramel in wax paper, twisting the ends to close. Store Kahlua Caramels in an airtight container and eat within two weeks…if they can make it that long. Cutting the caramels is a sticky process. Alternatives to buttering the knife are spraying it with nonstick vegetable spray or dipping the knife in warm water. Whichever way you choose, the caramels will form their final shape as they are rolled in the wax paper. The number of caramels will vary depending on how large you slice your caramels. Additional time is needed for the caramels to cool. Love the new blog layout and video! I like bourbon so I guess I would enjoy all of these options! Let me know how the bourbon caramels are!! Your caramels look PERFECT! And I love that you added Kahlua! PS…I’m featuring your Mounds brownie cupcakes on my blog tomorrow. They were amazing!!! I am so excited about tomorrow’s blog post on http://www.thatskinnychickcanbake.com. Can’t wait to check it out! Thank you! I love your advice! And, your caramels look divine!